LookTel Recognizer allows users with visual impairments or blindness to instantly recognize everyday objects such as packaged goods in the pantry, identity cards, soda cans at the grocery store, or CDs in a music collection. Once a library has been built, users can simply point the iPhone's camera at an object and the phone will recognize and describe the item instantly. LookTel Recognizer is powered by an evolution of LookTel's patented and proprietary object recognition technology featured in LookTel's "Money Reader", an app that has helped thousands of users with visual impairments or blindness instantly identify and count bills. There's no need to hold the camera still or capture a photo and wait for a result – recognition happens instantly, and in real-time. Additionally, the app does not require an active internet connection, which means it can be used at any location, anytime. The LookTel Recognizer App is intended for visually impaired users who can benefit from technology to assist in identifying objects. Recognizer permits users to store images of objects in a database, and have the iOS device quickly "recognize" these items later, by scanning the items with the camera. A barcode scanner is also included to provide additional identification and labeling help. Recognizer allows users to backup and export their created databases via E-Mail, enabling them to restore a database from lost or replaced devices, or share it with other members of the community to use. The Recognizer App is an app for iOS devices with a camera running iOS 4.3 or greater. These include the iPhone 3GS, iPhone 4, iPhone 4S, iPhone 5, iPad 2, iPad 3 and iPod Touch 3 and 4 as of September 2012. 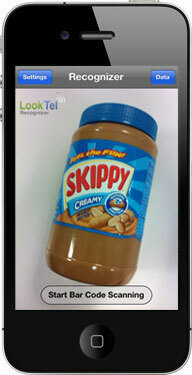 LookTel Recognizer is available in the iTunes App Store. Once the app is downloaded on your iOS device, you must create a library by capturing images of the items to be recognized and then labeling them with an audio description. To add an item to the library, launch the app, point the phone's camera at an item to be recognized, then double-tap the screen to capture a photo. Record an audio description once instructed by the app to do so, then double-tap the screen again to save. Once this process is complete, you'll be able to recognize the trained item by simply pointing your phone's camera at it. Please note that LookTel Recognizer requires high-quality, well-framed images with ample lighting for optimal recognition performance. Sighted assistance for initially capturing images and creating the library is recommended for users with blindness or severe visual impairments.